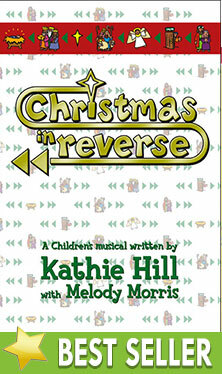 Christmas In Reverse : Kathie Hill Music, LLC, Making music with and for kids for over 25 years! Kathie Hill has done Christmas fore-wards and now, backwards! Instead of ending with the nativity, Christmas in Reverse starts at the manger then “rewinds” to give details on the events leading to the first Christmas. Teaming with co-writer, Melody Morris, Kathie provides a plethora of orchestral settings for this Broadway-styled musical. And long before the characters gather back at the manger, you will be touched (for the first or umpteenth time) by God’s reason for sending Jesus in songs like, You Chose Me, Waiting for Christmas and Come and Worship Jesus. So if you think you’ve chosen your musical for this year, it’s time to “rewind” and take a look at Christmas in Reverse. We used “Christmas in Reverse” with our 16 member children’s choir and our congregation was delighted with the clear Gospel message! Adding middle school narrators, teens for Mary and Joseph, young adults as Adam & Eve and senior adult wise men made this such an accessible musical. Thanks! Kathie's Note:This musical will surprise you. It seems so simple, but the impact is so great. People loves the emphasis on the manger and the fact that it is “Christmasy” from beginning to end. If you’re looking for a change from a theatrical musical, this work is for you. “Come and Worship Jesus” should be in every hymn book! Download digital file containing up to 20 audio examples for selected Musical Activities in the Director's Aide pages (contains printable faceplate in PDF). Downloadable pdf of all songs, script, production notes & piano transcription with permission to make 3 copies for each $11.95 license. Additional copies require purchase of additional 3x license/s. Up to 200 downloadable PDF pgs of lesson plans, kick-off ideas, musical & spiritual activities and production & organizational helps. The downloadable MP3 of the ACTIVITY CD includes up to 20 audio examples for selected Musical Activities in the Director's Aide pages. 6 songs downloadable orchestrations for 2/ violins and/or brass.